We have a very special relationship with our environment. The sooner we realize it, the better it is for all of us. Life as we know it came into being because of the environment. Having given birth to it, it has nurtured and supported it and provided the playground for its evolution. It continues to do so in spite of the ravages caused to it by the modern man. The environment in our living experience appears in five principle forms, namely the earth, water, air, space and energy. These five individually and in conjunction with the others take on millions of forms. For example, earth appears as dust, sand, boulders, hills and mountains; water appears as vapour, moisture, rain, streams, brooks, rivers, ponds, lakes, oceans, snow, glaciers etc. ; energy appears as heat, light, sound, electricity, magnetism and so forth. Air is a subtle element and hence we can only experience it in its various forms and moods. Space is very subtle and so we sense it when it is missing or crowded out. Together they create this wonderful universe. Similarly life has taken on zillions of forms; the amphibians, the reptiles, the worms, the bacteria, the birds and beasts, the trees, the creepers, the bushes the algae and so forth. Because of our reductionist ways of thinking and perception, we do not see that our environment is an integrated whole. We also do not see the oneness of life. We have cut it up into meaningless and lifeless shreds. We have also missed the wonderful relationship between life and the environment. Many people, particularly the indigenous ones, see the environment as the mother, playmate, lover or companion. They respect and love it, at times even worship it. Modern man sees it as a wild beast to be tamed, domesticated, mastered and then enslaved. The environment, taken as a whole, is our primary resource for living, play and evolution. When we break it up it loses life and meaning. That is what has happened with money. It is not part of the natural environment. It is a creation of man. Progressively it has become more virtual and artificial. Money does not fulfill any of our needs, either of sustenance or evolution. But we have come to believe this myth. We are living with many other myths. A most pernicious one is the existence of the individual independent of the environment. Let us identify all these modern day myths and drop them. Then we can live truly as human beings playing our rightful role in the natural scheme of things. Ganoba, formally Ganpati Krishna Date, was a long-time participant in various Awakin Circles around the world. As with his life, his passing was equally beautiful reminder about the values of 'oneness' that he deeply stood for. People would often seek out his wisdom, but in place of writing formal books, he preferred to share dynamically with each person -- either via FaceBook or comments on Awakin. Seed questions for reflection: What do you understand by our environment being an integrated whole? Can you share a personal experience where you saw the oneness of life? What modern day myths are you practicing dropping from your life so that you can live truly as a human being? I wanted to share a comment about this week's guest speaker Awakin gathering with Rev. Heng Sure. His stories of being at gunpoint at several points during his bowing pilgrimage made me think about the source of gun violence. Americans value and respect power, and guns can offer a false sense of power and security. From my view as a Jain, homicide is never justified. It was rewarding to hear about how these two monastics continued to wish people well, no matter how much violence or power people tried to hold over them. A well written piece and a common theme to remember. We do need to take the advice above, but remember that the main issues are the ways mind is relating to various objects. The barter system is now seen as a more pure form of trade (than money) and engagement. But due to scarcity and greed it evolved from the basics, the essence, of giving. The US money system, once backed by gold, is another further step away from pure giving. Yet it is here and it will not go away as long as greed and scarcity prevail (both mindsets). We can't just do away with them, just as we can't do away with hatred and greed. Even in our own minds we have not this capacity, so how do we wish it upon others? We need to dig in, and get to work on the very factors that have created these issues. Namely our own greed, ignorance, etc. and stop blaming systems that are generated by the very qualities we posses. Understanding that if greed itself were eradicated then whatever was left would function more purely be it political systems or money. So enough talking a reading and playing these intellectual games. Sit still, focus on your breath, observe the chaos of your own body and mind until equanimity develops. Once this is solid then with a balanced mind change the world as a firm example. I never appreciated and embraced my environment as an integrated whole to the extent I do now. Six years a dog owner, I am outside more than ever. Just tonight, we walked the high ground (too wet and too dark to walk the valley) and enjoyed the falling snow, moderate temperature and stillness of the night. I especially like when Kobe stops to smell footprints left by the dog that walked before him. As I stand in wait of him, I can fully take in the pure beauty of all that is around me. The world and everything in it is "a gift" and needs to be treated as such. Making money is the means by which we become self-sufficient. This quest for success takes risks and when the risks reap financial rewards it creates pshchic rewards. There is enjoyment and high feeling when we prevail in challenging situations. There is also the enjoyment of work and work offers the arena to assert ourselves, and hence to maintain the sense of self. Making deals and taking risk is not only making money, it is a way of literally making more of ourselves. Money is the yardstick which we measure ourselves and the success in life. Above all, money is the only thing we can depend on to feel self-sufficient. It is a source of security. Money seems certain. It is the sure means to get our way. Money is like ego inflation and once it is set in motion it is difficult to stop. So what is important about money is our ego and the other side of this coin is our pride. The balancing between money and the ego, achieving something truly great for others, is getting past the ego. Getting past the ego can actualize an objective value, achieve real peace, or help others in concrete ways. The essence of greatness is the ability to find ways to alleviate the burdens of others and making life better for everyone. Peace and prosperity creates a common immediate circle to the world. This circle is not without ego, but the ego is in service of something outside. It influence others to obtain goals which is valuable to everyone. The bottom line making money is empowering, and I hate to say this, but God is boring. The Psalm says, "Be still and know I am God" and to me this feels like resignation and giving up. When I am still my attention shifts away from any real needs. Ironically, I lose interest, little energy or little relating, and I drift off and others drift away. So this transcending the ego may take a high state of integration and transforming everything, but I have not adjusted to this black-hole where there is no achievement or no accomplishment. This stillness is closer to despair and depression than the glory of God. I realize I want my ego gratified and I realize there is no making any sales pitch convincing to God to do otherwise. I just want to get out of this neutral gear and shift into overdrive of self-promotion. There is something within my ego that wants to advertise myself relentlessly and even make myself better than I am. However, this arrogant and cocky high impression never works, just as money never works to measure myself with God. I, therefore, feel bored and my experience of God is like gathering a cloud, which may produce great power or merely dissipate in the next breeze. Something is missing and I cannot quite put my finger on it, but I feel the lack none the less. I can only say because I am not making money and I am on disability I am bored with life. Everything feels like nothingness. There is nothing to believe in, nothing true or nothing valuable. The darkness is rather perverse. There is also an underlying depths and a transformation within this nothingness that offers clarity. Yet to my ego mind I cannot understand it, so I feel boredom. Maybe there is a spiritual injunction "to be in the world but not of it" only I have not grasped this inner Essence that is beyond my ego mind. Our environment being an integrated whole means to me it is all interconnected and deserves to be honored and respected. I've experienced the oneness of life on many occasions, but several stand out. Walking in the woods and feeling so serene and peaceful; my heart felt this expansion as my lungs breathed in the fresh air and listened to the wind softly blowing through the leaves on the trees and the sun filtered down on my face. Small animals that I could not see scurried amongst the branches and forest flow. Birds sang. 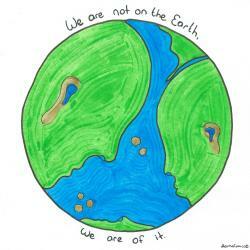 We are part of the environment, not apart from it. Our DNA and the DNA of a plant or animal are much more alike than different. As Deepak Chopra says, the air is my breath, the rivers and oceans are my blood and circulation, the earth and stars are my body. What we do to the environment we do to ourselves. So called primitive uncivilized people knew this, and we so called advanced people don't. Since becoming aware of this, I to some degree see the oneness of all that is almost always, and my life is fuller because of this awareness. I'm dropping the myth that the environment is ours to conquer, control and exploit. I'm dropping the myth of a sky god and realizing the truth of earth god. God and heaven are within our environment and us, and we are within God and heaven. The American Indian,various cultures, Jesus and other spiritual leaders knew this. Brother sun and sister moon are becoming my reality. The words human and humus are derived from the same root -- that says it all. Our environment including us is an integrated whole, if we see it or not. The third paragraph disturbs me, however it could cause one to question themselves, by saying "Do I do that?" I agree with what he said about money, though I don't think it should be demonized, but respected as what it represents at the time/in the given situation.